We enjoyed a special Arabian lunch in the Pinnacle Grill. 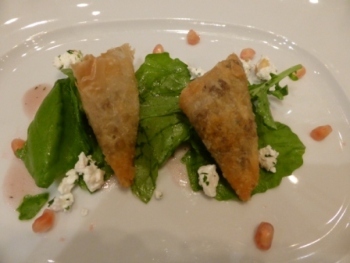 After an appetizer of stuffed grape leaves, our first course was a pair of Crispy Samboosaks (spicy and stuffed with lamb) over an arugula salad with feta cheese and pomegranate dressing. Next was a Seafood kebab with grilled swordfish, shrimp and tuna over basmati rice. 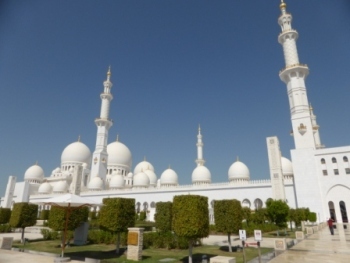 The Sheikh Zayed Grand Mosque in Abu Dhabi is one of the largest in the world with 32 domes. 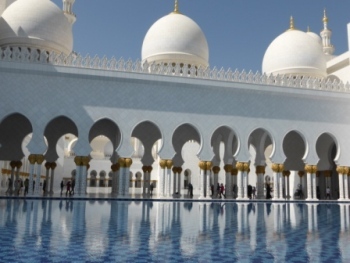 Outside the mosque is surrounded with gardens and reflective pools. 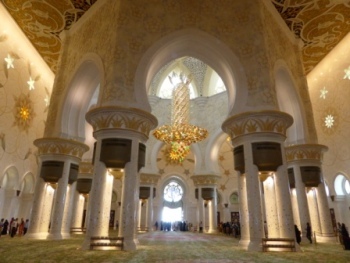 Inside the chandeliers are trimmed with 24-karat gold and the carpet is the largest handmade carpet in the world. 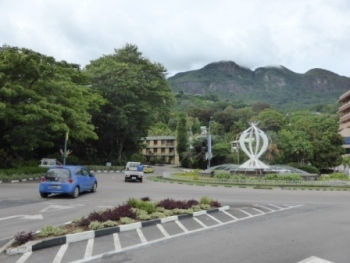 We walked into the town of Victoria, Seychelles to catch a local bus. 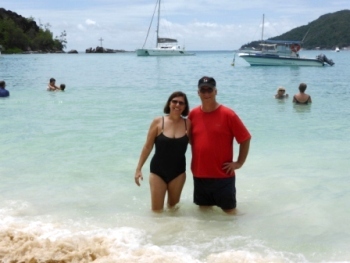 The one and a half hour ride cost us 40¢ each and took us 3/4 of the way around the island to Port Launay. 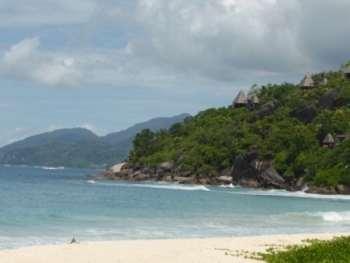 The scenery along the way was beautiful; and we were able to spend a couple of hours swimming in a calm bay of the Indian Ocean. We took a full day tour on the island of Mauritius. 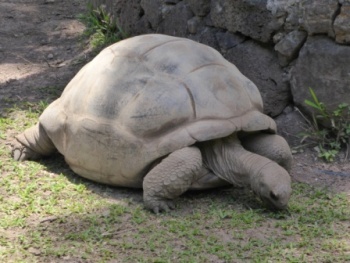 Like the Galapagos, this island is home to Giant Tortoises. Unfortunately, they have to be kept in a protected reserve today; since original settlers found them to be easily caught and good eating. They were hunted almost to extinction. Nearby is a large area of exposed dirt called Seven Colored Earth, due to the different minerals and composition of the soil. 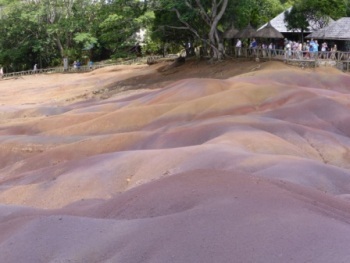 Miraculously, they have not mixed; and the different soils make a landscape tapestry. 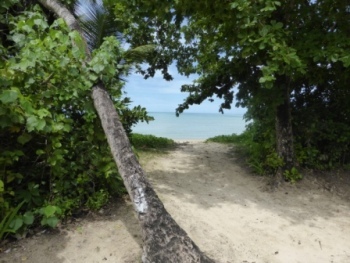 What would a tropical island be without a perfunctory waterfall? 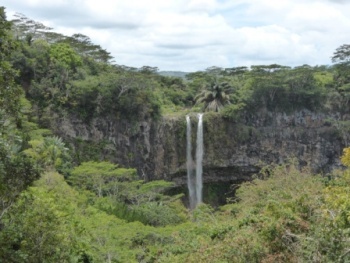 This is lovely Chamarel waterfall in the Black River Gorges National Park. The wild strawberries growing here look like a cross between a red raspberry and a strawberry. 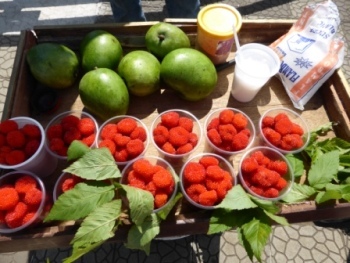 Despite their vibrant color, the taste is pretty bland and needs sugar added to enjoy. 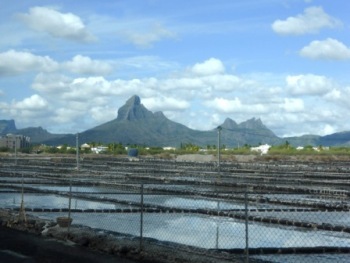 Sea salt distillation contributes to the local economy. 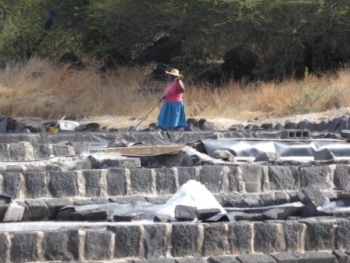 We saw both men and women working in the salt pans. 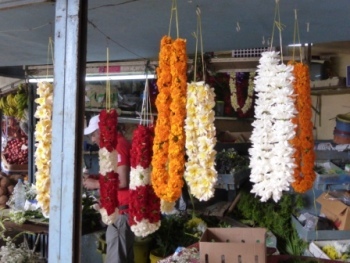 In the market we saw what looked like Hawaiian leis for sale. Our guide told us they are used in Mauritius to decorate the front door where someone recently died. 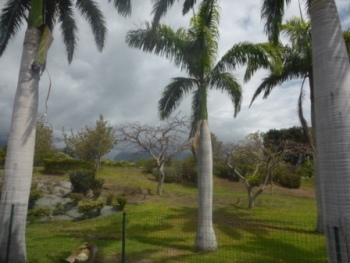 The island of Reunion was not as inviting for tourists as the Seychelles nor Mauritius. There is a strong undertow, so there is little swimming; although the coastline is dramatic with huge cliffs dropping into the ocean. 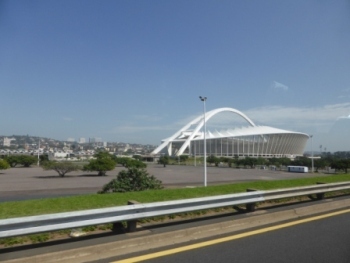 The ultra modern soccer stadium built for the 2010 World Cup is just one of many great buildings in Durban, South Africa. 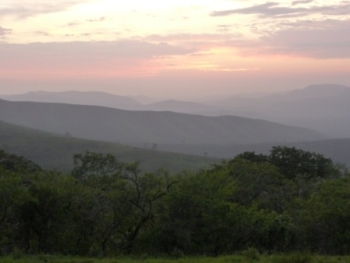 As we crossed the Tugela River about 1 hour from the city, we entered Zululand. 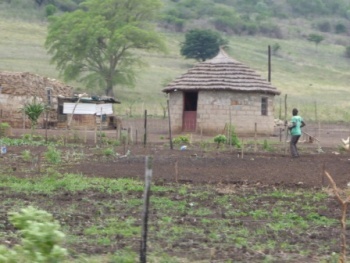 The traditional round, thatch roofed homes are still the house of choice for the majority of Zulu people. They believe that evil spirits hide in corners, so they only want to live in round houses. 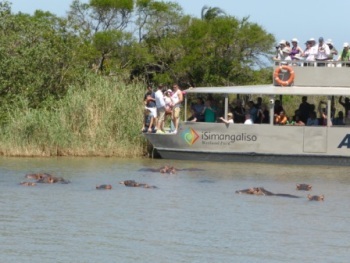 The double decker boat we took in the World Heritage Siyabonga wetlands, let us get right up to the pods of hippos in the estuary. 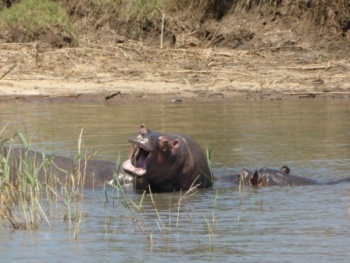 This hippo yawned when he saw us. 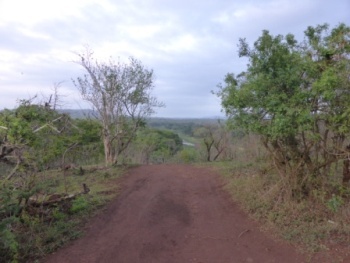 Another two hours drive and we arrived at Hluhluwe-Imfolozi Game Reserve, the oldest in South Africa. We took a night drive in open air jeeps through the park looking for animals. It is run like a National Park with rangers that search the 960 sq. kilometers for poachers, which are shot when sighted. 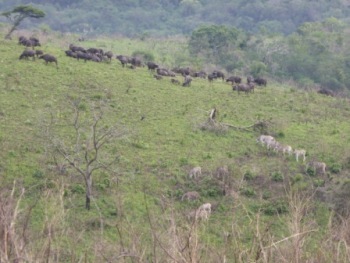 Herds of zebra and African buffalo roam freely. 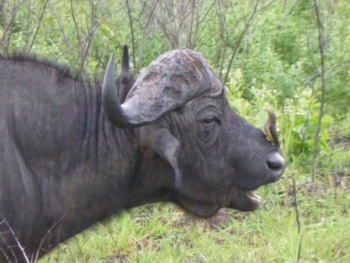 This African Buffalo is enjoying the work of the Red Billed Oxpecker, who hops all over his body eating ticks. 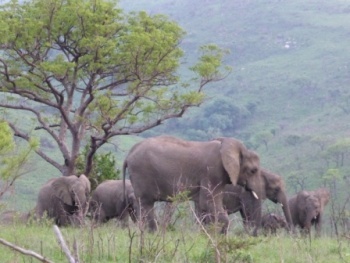 Herds of elephants and their babies stood near the road side. None of the park animals are fed by humans, so they don't approach or become aggressive. 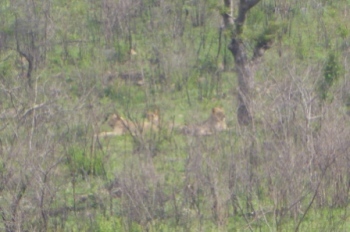 We spotted a pride of 3 lions way up the hill, but didn't approach them. 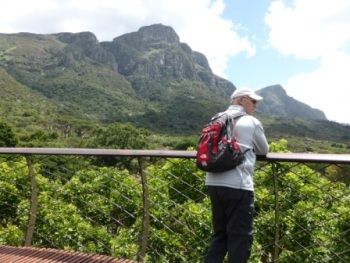 People are not allowed to walk through the reserve unless they are with guides; and even then, most of the viewing is done from the safety of the jeeps. 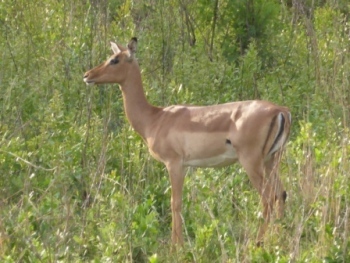 The female impala looks a lot like a deer. After sleeping in our hut, we woke up at 4:15AM to begin our 5-8AM morning drive before breakfast. The animals are more active early and late in the day. 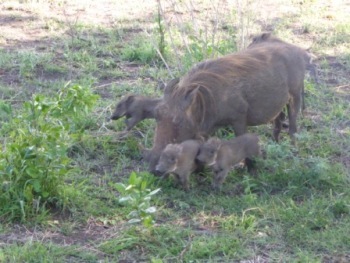 It was a joy to watch the mother warthog and her litter of two week old piglets. The little ones ran in circles, jumping and playing with their tails pointed straight in the air, like a flagpole. Since it is spring here, many of the animals had young ones. 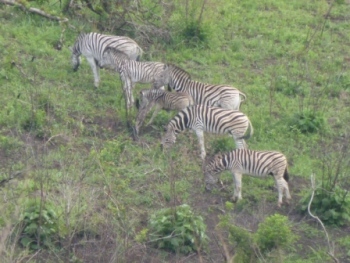 We learned that zebra's manes stand straight out when they are healthy and lean over, if they are undernourished. 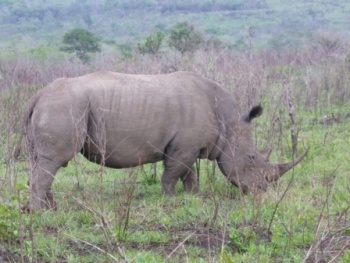 White rhinos are huge and look threatening. Most of them that we saw, just ignored us - thankfully. It's hard to imagine that these are the same type of animal. 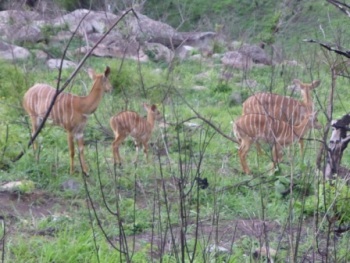 On the left are female nyala (with stripes and short hair). 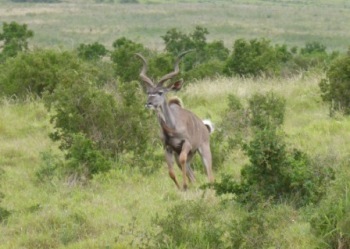 On the right is a male nyala, with horns, long dark grey hair and light clay colored legs. 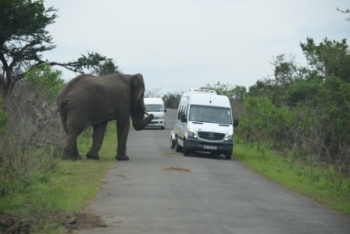 The scariest thing happened as we were leaving the reserve in an enclosed van. 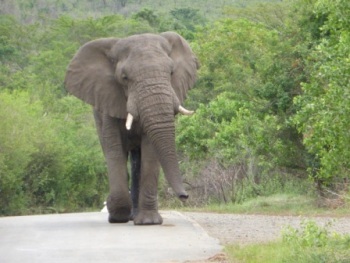 A bull African elephant was approaching us on the road and wasn't happy that we were there. He was in rut and smelled heavily of musk - kind of like a teenaged boy on seroids. We were lucky to have friends watching and taking pictures of the whole encounter from another van. Look how big the elephant is compared to us! 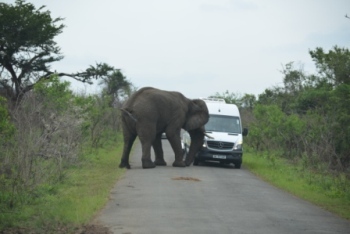 He came up to our van and picked up the front corner with his tusk. We were afraid he would try to flip us over, which he easily could have done. Our driver quickly backed up, but because we had a trailer (for luggage) he couldn't go very far. We stopped and hoped that he would see that we didn't want a fight. He stood and watched us, then started to approach again. Our driver drove quickly past him. 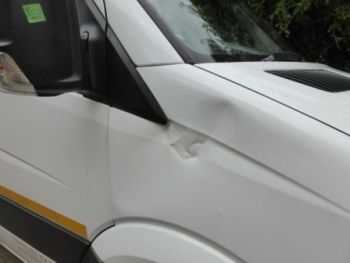 We later got out to see the dented damage done to the fender/hood and saw that the front headlight was also broken out. As if that wasn't enought danger, later that day we entered the Emdoneni Cheetah sanctuary and had a chance to pet one of these beautiful creatures. 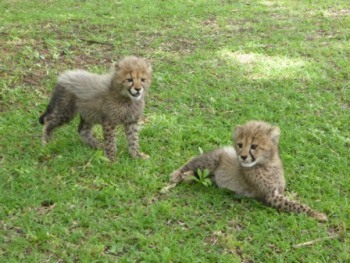 We were the first group of visitors to see the new-born female cheetah pups. 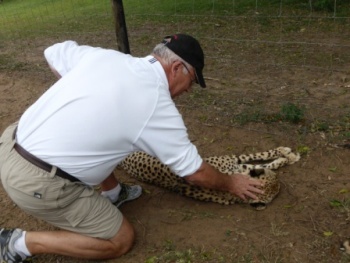 They were not in pens and the owners had recently bought them for $10,000 each to increase the gene pool as they try to raise cheetahs that will be released into the wild. 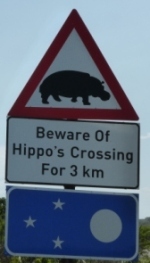 We saw a lot of warning signs on roads in South Africa that were new to us. 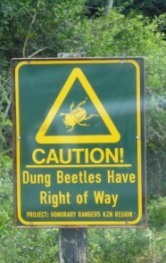 "Beware of Hippo's Crossing" and "Dung Beetles Have Right of Way"! 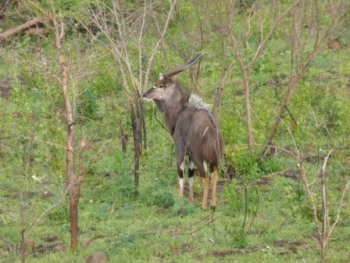 In Addo Elephant National Park near Port Elizabeth, we saw many kudu. This male jumped up to run as we spotted him. 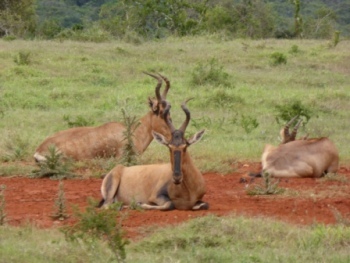 The graceful Red Hartebeests were lying in an open spot of earth that helped to camouflage them. 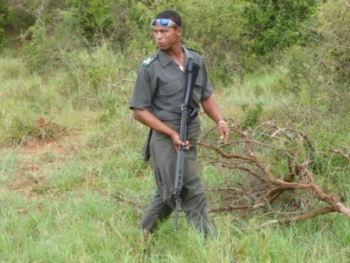 Armed park rangers roamed through this park (the third largest in South Africa) looking for poachers. 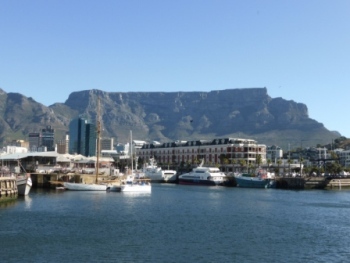 On our first day in Cape Town, South Africa; we caught a ferry out to Robben Island, where Nelson Mandela was a prisoner for many years. 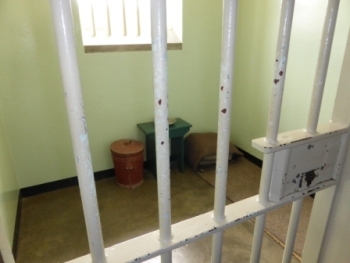 The small cell where he was kept was furnished as it had been - with a mat, one blanket, hard pillow, a bucket and a small table. Prisoners were only issued shorts, no shirt or shoes; fed meager rations; and forced to do hard labor in the limestone quarry. It was cold when we were there and most of us had jackets; so prisoners must have been miserable in those conditions. It's hard to imagine that they survived. 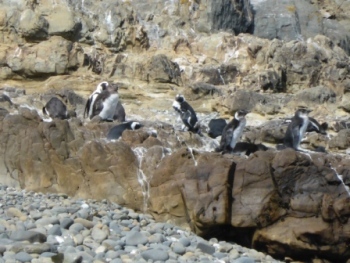 African penguins live out on the island. The one hour ride out to the island was in a small ship in which prisoners had been transported. But going back the seas had gotten rough and many people on the ferry had to use the vomit bags. Not fun! 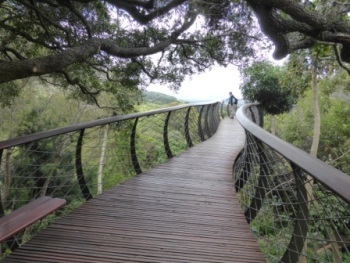 The well cared for Kirstenbosch National Botanical Gardens had a wonderful Tree Canopy Walkway that led us up into the tree tops. 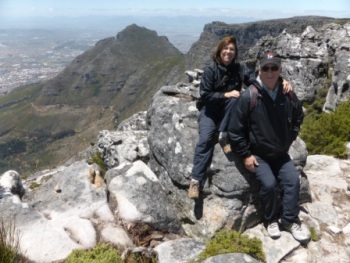 As we walked we were able to enjoy immense views. We had lunch in the garden and ate a kudu (antelope) wrap, vetkoek and ostrich. 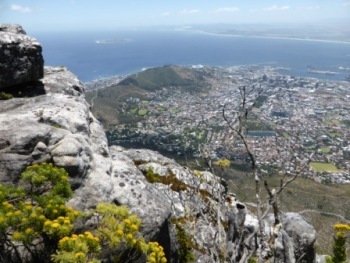 Majestic Table Mountain gets its name from its distinctive shape. 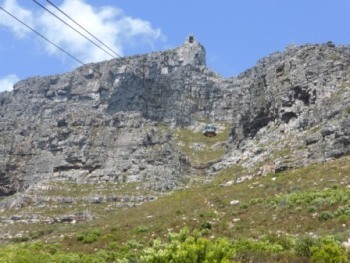 We rode the cable car up to the top. . .
where we perched along the edge to look down on the city below. You can see Robben Island in the distance. 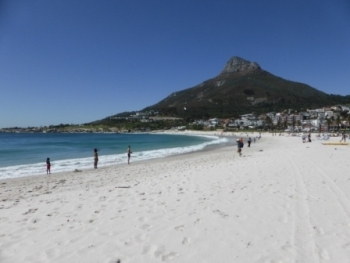 At Camps Bay, we had lunch and walked along the white sand beach. 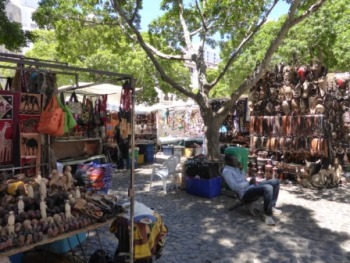 Back in the heart of the city, Greenmarket Square was a city block of arts and crafts with vendors from all over the Continent in an open air market. 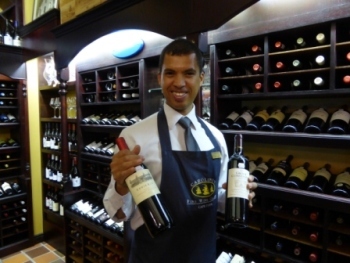 After visiting the Constantia vineyards, we chose bottles of cabernet sauvignon from Groot Constantia & Ernie Els wineries. 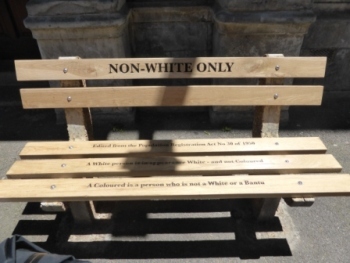 This bench located in front of the Cape High Court is a reminder of the Apartheid times.